posted: June 19, 2017 by: Vetstreet Tags: "Clinic Specials" "News"
If an ounce of prevention is worth a pound of cure, in the case of canine parvovirus, it’s worth, well, everything, as there is no cure. Dogs catch canine parvovirus, commonly called “parvo”, from infected dogs or feces, and left untreated it means almost certain death. Signs of parvo are easily confused with those of simple gastrointestinal distress and include tiredness, vomiting, and diarrhea. Once a dog is infected by the virus, it must run its course, and treatment is limited to supportive care — hospitalization, IV fluids, anti-vomiting and -diarrhea medicines, and antibiotics to prevent other infections. With the right ongoing treatment, dogs can survive but without it, the mortality rate can exceed 90 percent. Parvo is a deadly disease caused by the canine parvovirus type 2 (CPV-2) virus. The virus attacks the gastrointestinal tract and immune system of puppies and dogs. It can also attack the heart of very young puppies. CPV-2 is highly contagious. It’s spread through direct contact with infected dogs or infected feces. It’s easily carried on hands, food dishes, leashes, shoes, etc. The virus itself is a hardy one. It’s very stable in the environment and can survive for more than a year under the right conditions (away from sunlight and appropriate disinfectants). Though up to 85 to 90 percent of treated dogs can survive, the disease requires extensive supportive patient care and can be expensive to treat. In untreated dogs, the mortality rate can exceed 90 percent. Unfortunately, these signs may be confused (at the outset of the infection, especially) with simple gastroenteritis, often leading owners to delay treatment until dogs are devastatingly dehydrated. In the meantime, other dogs in the household may have become infected. The severity of parvovirus infection varies widely. 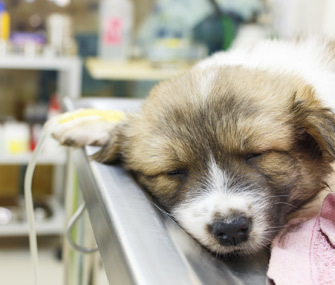 In many cases, especially among very young puppies, death can occur in two to three days. In some especially severe cases, an intestinal obstruction can occur as a result of increased intestinal motility during the disease process. This kind of obstruction, called intussusception, occurs when the intestine “telescopes in” on itself. This is life threatening in itself. Veterinarians make their diagnoses based on history, signs of disease, physical examination, and laboratory tests performed on blood and feces. Sadly, parvovirus knows no breed limits. Dogs of all breeds are susceptible. Treatment is limited to supportive care: providing fluids, administering medications to reduce vomiting and diarrhea, and administering antibiotics to prevent secondary infections. In cases of intussusception, surgery is required. Because of the prevalence of the disease and its severity, the CPV-2 vaccine is considered a core (essential) vaccine by organized veterinary medicine, meaning that all dogs should be protected from this disease. Vaccination safely and effectively prevents disease associated with CPV-2 infection. The CPV-2 vaccine is typically given in a combination vaccine that also protects against other serious diseases, such as canine distemper and canine adenovirus-2. In general, all puppies should receive a minimum of three doses between 6 and 16 weeks of age, followed by a booster one year after the last dose. Thereafter, booster vaccinations are administered every one to three years. Infected dogs should be kept isolated from other dogs until they have recovered and are no longer shedding (spreading) virus. The environment, bowls, etc. should be disinfected with a dilute bleach solution, which kills the virus. All puppies should be kept away from other dogs, dog parks, groomers, and pet stores until the puppy vaccination series has been completed. Socialization with other dogs should be limited to healthy dogs whose vaccination status is well known.